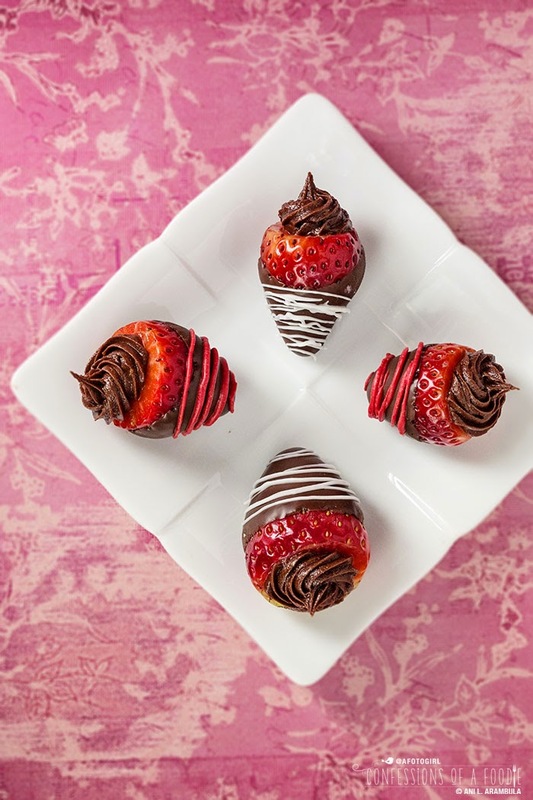 Driscoll's organic strawberries are dipped in premium dark chocolate then stuffed with Nutella flavored cream cheese. They're a tasty treat for your sweetie! Valentine's Day is this Saturday and I've got an easy treat for you to make for your sweetie. I have always been a fan of chocolate covered strawberries. I've made them many times for parties. They're super easy but look impressive. I've made cheesecake stuffed strawberries before but not chocolate covered. 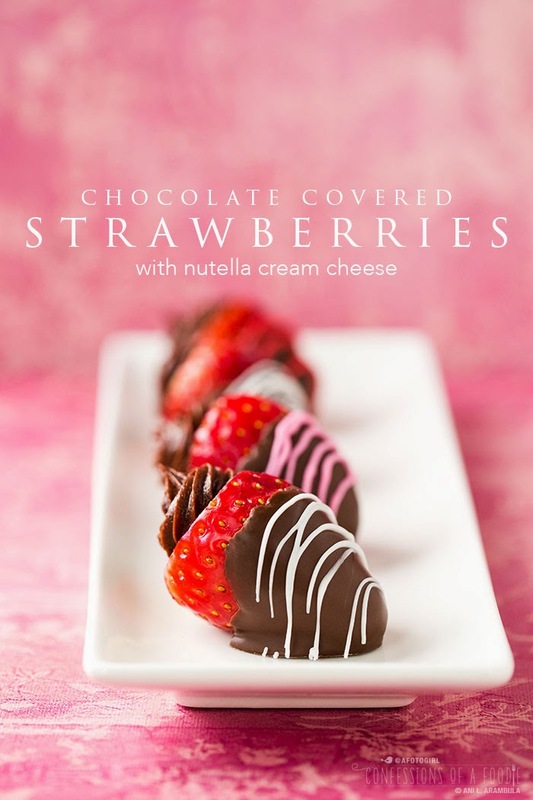 When Driscoll's asked me to come up with my take on a chocolate covered strawberry, I knew I wanted to stuff them. I waffled back and forth between flavors and one morning while dining with my auntie, she suggested Nutella because we are both fans. I made my first batch and took them to work for taste-testing. Everyone enjoyed them so I knew I was onto something. I made them three additional times tweaking HOW I made them to see if it was better to cut then dip or dip then cut? At one point, these were lollipops but those became a bit tricky when stuffing them as the weight of the cheesecake caused the strawberry to slowly slide down the stick. I finally settled on no stick, dip first, cut after and then stuff. See? I do all the trial and error so you don't have to! If you've never made chocolate covered strawberries, be sure to read the tips first. Besides what's pointed out above, I also added a single packet of powdered stevia to the cheesecake mixture to cut down the tanginess of the cheese and sweeten it up. You could use sugar if you're so inclined or your favorite dry sugar substitute. My first go was hollowing out the strawberries then dipping. I found the moisture from the opening streaked the chocolate. Since I was using premium Guittard wafers, I opted to use a double boiler method to melt the chocolate. Microwaving gives you less control (I've burned chocolate in the microwave too many times!). I also like keeping the steaming pan of water on so I can return the bowl of chocolate to it if it starts cooling down too much, thickening in the process. 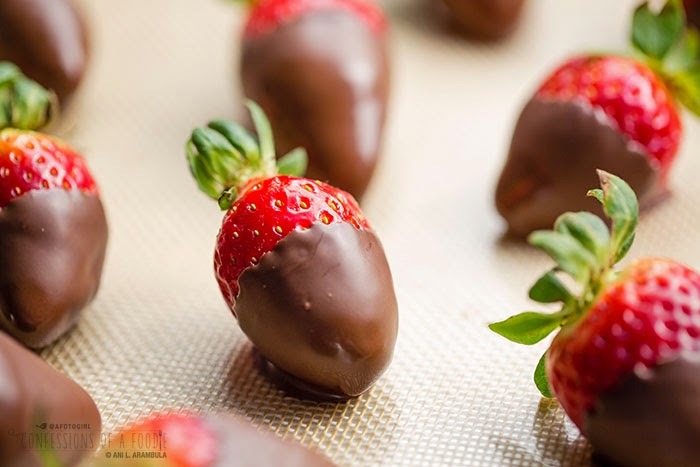 A lot of how-to's suggest holding onto the green tops to dip the strawberries into the chocolate but I find that there's less control and it gets fairly messy. I prefer putting them onto skewers. This way, you keep your fingers clear of chocolate and you can gently tap the skewer on the edge of the bowl to remove excess chocolate. 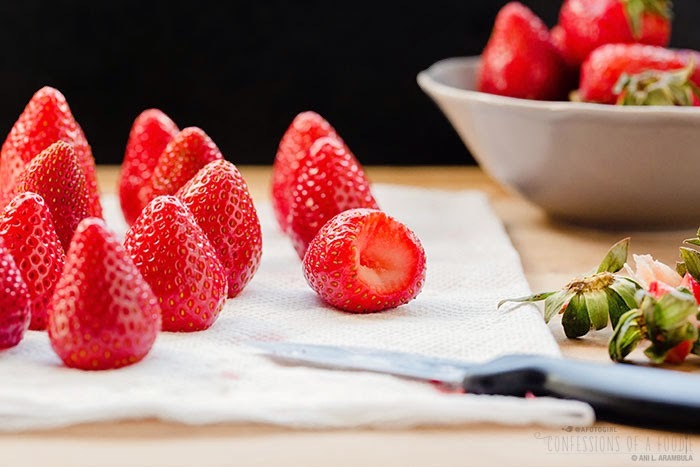 To get a well defined tip on your strawberries, after you place them on a silpat (recommended but baking parchment or waxed paper work fine too), nudge them forward about ⅛ to ¼ inch so that the tip gets past the puddle of chocolate. This creates a nicer "foot" on the strawberry while keeping the foot away from the tip. Prettier, I think! Now these Wilton candy melts are a little less finicky than premium chocolate so you could place the wafers in a mug and microwave to melt but since I already had the double boiler method set up, I melted them that way, one at a time, cleaning and completely drying the double boiler insert after each one (water is the enemy of melting chocolate/candy and will cause it to seize). You don't have to invest in disposable piping bags to decorate. Just use a resealable sandwich bag. 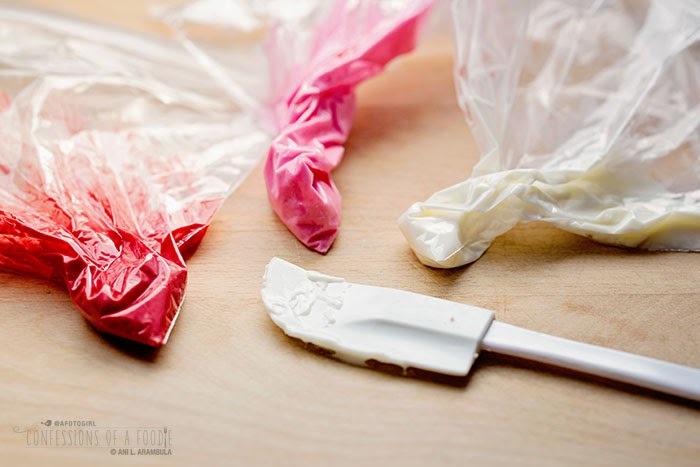 Place the melted candy into the bag, massage it into a corner then snip a teeny tiny piece of the corner away. A smaller hole gives you more control over the candy stream. I prefer to melt more chocolate than I think I need so that the strawberry gets a good, even dip. 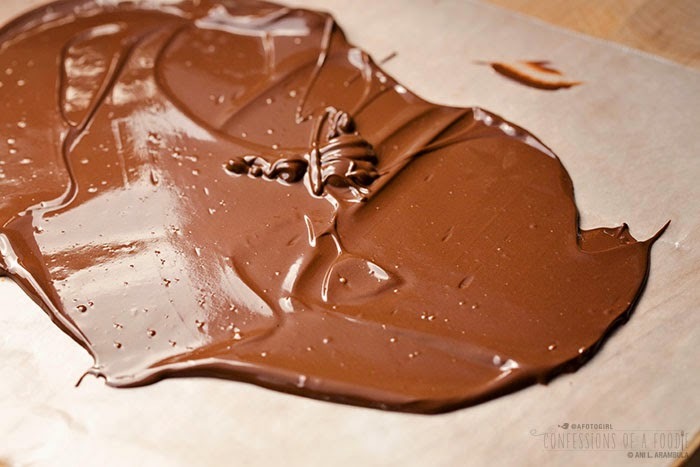 When you're finished, pour the chocolate out onto a silpat or waxed paper and allow the chocolate to cool and harden. 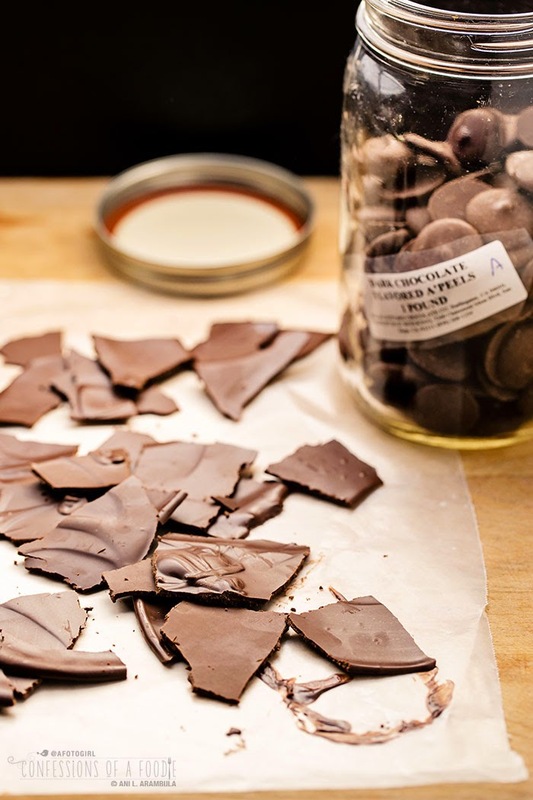 Then simply break the chocolate up into smaller pieces and return it to your storage container to re-melt next time. Or, if you're feeling a wee bit more decadent, spread the chocolate to ¼-inch thickness and add some nuts and dried fruit to make your own homemade bark. That's two, TWO, treats for the effort of one. Cool, huh? Strawberries should be at room temperature. Rinse berries and then thoroughly dry each berry with a paper towel before placing them onto a large rimmed baking sheet lined with paper towels. A wet berry and chocolate do not mix. You'll wind up eating them while you make them because they look too awful to serve to your sweetie pie tossing both out in frustration. Premium chocolate hardens quickly so if you decide to decorate by adding sprinkles or nuts, add these right after dipping. Waiting even just a minute might be too long, especially if you're using professional grade confectionary chocolate. Because of the cheese, strawberries should be stored in the fridge. Make sure to bring them out a half hour before serving to take the chill off a bit. I buy my premium chocolate wafers at Do It With Icing! in Kearny Mesa and the candy melts at Michael's. You could use bittersweet chocolate chips but once you use good professional confectionary chocolate, you'll not want to use anything else. Do It With Icing! sells 1 pound bags of both Guittard (around $5) and Merkens (if memory serves me right, it's just over $6) brand chocolate wafers. I've used both and prefer Guittard. It melts better, hardens faster and I feel, has better flavor and mouth feel. I used both Nutella brand hazelnut spread and Justin's brand which has half the sugar of Nutella. To eat straight out, Justin's is fantastic. It's the difference between using Skippy peanut butter or the fresh natural peanut butter you buy at Sprouts: one is super smooth with more structure and no oil separation, the other, though more nutty flavored, is coarser, a bit oily with less structure. The Nutella brand is what you see in these photos. They held their peaks better and made for a much smoother cheesecake. Justin's was too loose and gritty and some of the strawberries became a bit lopsided as the Justin's made cheesecake filling slowly slid off the strawberry. I used a disposable piping bag that I picked up at Michael's with a star piping tip to get the pretty swirls for presentation. Feel free to use a ziplock baggie sans piping tip for a more straightforward presentation. 1. Rinse strawberries well and thoroughly pat dry. Place on a towel-lined baking sheet. Set aside. 2. Line a second large rimmed baking sheet with waxed paper, a Silpat or baking parchment. Set aside. 3. Fill a small saucepan with 1-inch of water. Place a stainless steel or glass bowl so that it sits atop the saucepan without floating in the water and put saucepan on medium high heat to bring to a low simmer. Add chocolate to bowl and let sit for 45 seconds, then stir with a rubber spatula until most of the chocolate has melted. 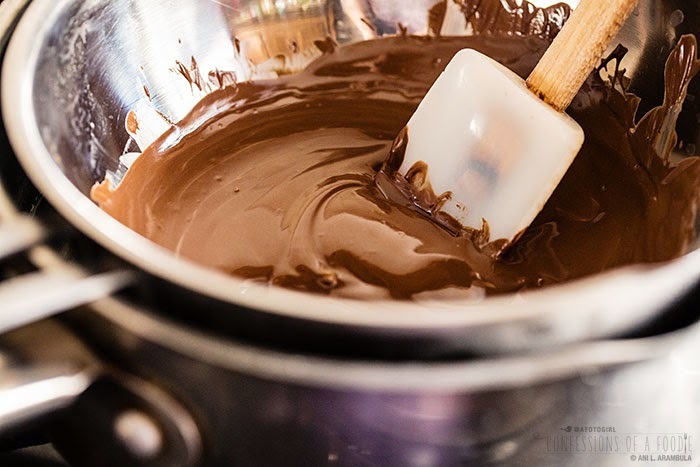 Carefully remove the bowl of chocolate and place on work surface; continue stirring until chocolate is smooth and completely melted. 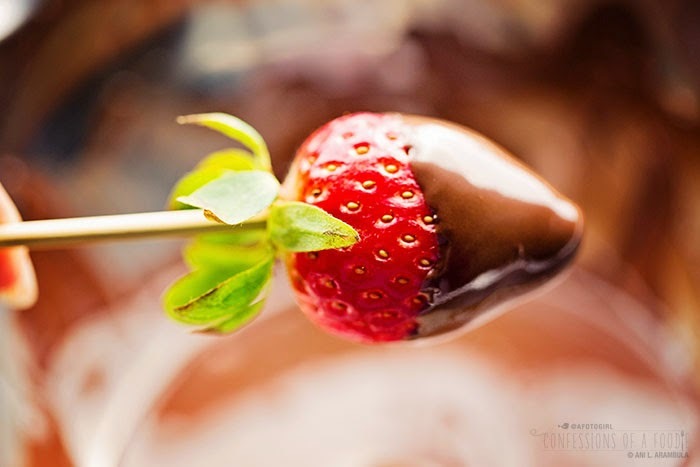 Poke a strawberry with a skewer and dunk it ⅔ of the way into the chocolate, swirling the strawberry to coat. Lift out and gently tap the skewer on the side of the bowl to remove excess chocolate. Carefully slide the strawberry off the skewer onto the silpat lined baking sheet. Nudge the strawberry forward ¼-inch or so to ensure the tip of the strawberry is not sitting in a puddle of chocolate. Repeat with remaining strawberries, returning the chocolate bowl to the saucepan of simmering water for a minute or so if the chocolate cools off and starts to thicken. 4. Place 10 wafers of candy melt of choice into a clean, dry double boiler to melt. Transfer melted candy to a resealable sandwich bag. Massage candy into a corner and snip off corner. 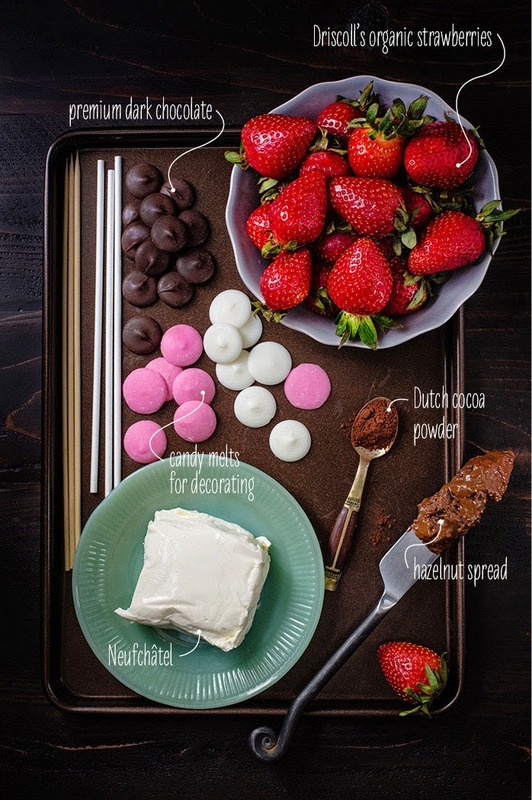 Carefully drizzle the candy over the strawberries to decorate. Allow strawberries to harden completely at room temperature, about 30 minutes. In the meantime, make the cheesecake stuffing. 5. Beat the cheese, cocoa and stevia with a hand mixer until thoroughly combined and fluffy. Prepare a disposable piping bag with a star tip (go here for a short video tutorial if you haven't used a piping bag before); add the cheesecake filling to the bag. Place bag in refrigerator until ready to use. 6. Carefully pick up a strawberry, avoiding the chocolate, and use a pairing knife to slice off the top green part of strawberry. Use the tip of the knife to make a little well to hold some of the cheesecake filling. Return to baking sheet and repeat with remaining berries. Once all berries are prepped, pick up a strawberry, again avoiding touching the chocolate so you don't leave fingerprints on it, and pipe the cheesecake filling into the hole and then pipe it around the edge of the berry, swirling back towards the center and gently lift up to create a tip right in the center. Repeat with remaining berries. Place berries in an airtight container and refrigerator up to two days. Remove from refrigerator 20 to 30 minutes before serving. Want more inspiration and technique tips from a pro? Driscoll's has a few more ideas for you. 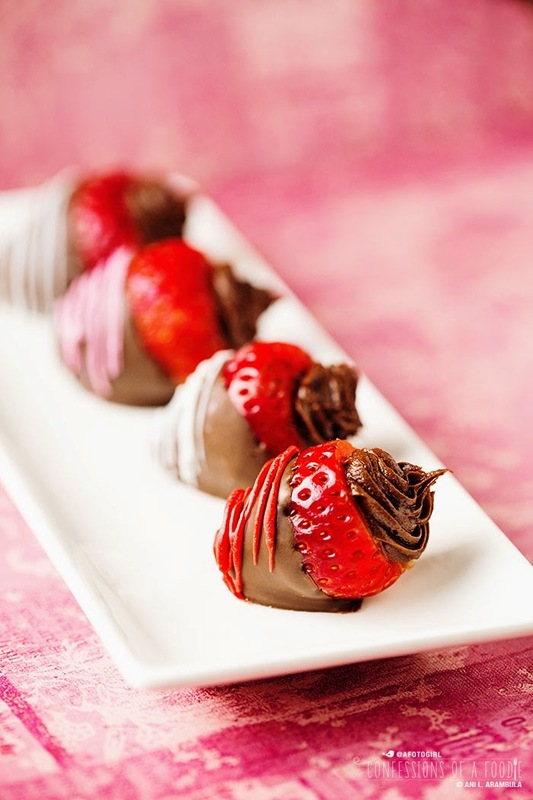 However you celebrate with your special someone, kids or friends and family, chocolate covered strawberries adds a bit of sophistication to the festivities. Hope you give them a whirl! Until next time my friends, Happy Valentine's Day! 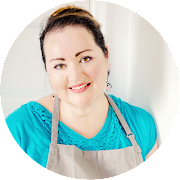 Disclosure: I received vouchers for reduced priced berries and a gift card for Whole Foods from Driscoll's to help cover the cost of recipe development. I received no further compensation. Recipe and opinions expressed in this post are mine.